North and South Korea are holding another round of reunions of families split by the countries' war in the 1950s, despite an exchange of fire between border troops on Friday. More than 400 South Koreans were bussed over the border for a three-day reunion with relatives. The reunions will take place at the Mount Kumgang resort. The meetings are the first since the South accused the North of sinking one of its warships in March. Lee Jong-joo, of the South Korean Unification Ministry, told Agence France-Presse news agency: "The reunions will go ahead as scheduled despite the firing." On Friday, North Korean troops fired two rounds towards a frontline unit at the border and South Korean soldiers returned fire three times. The shooting occurred in Hwacheon, some 90km (56 miles) north-east of the South's capital, Seoul. 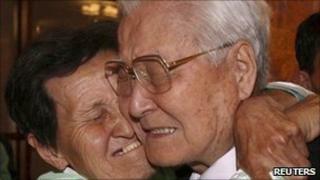 The latest reunions involve 97 South Korean families, who will meet the same number of North Korean families. Lee Moon-yeong, in his 70s, told AFP he was meeting a brother he thought might have been killed in the Korean War. A second set of reunions is set for Wednesday-Friday at the same venue, involving 96 South Koreans and 207 North Koreans. The last reunions were held in October 2009. Tensions between the two rivals have been high since the South accused the North of torpedoing one of its warships in March, with the loss of 46 lives. Pyongyang denies the charge. Millions of people were separated from their families during the chaos of the 1950-53 Korean War. The North and South are still technically at war because the conflict ended in an armistice and no peace treaty was signed. About 20,000 families have been permitted brief reunions since a landmark inter-Korean summit in 2000, but the Red Cross-brokered programme has been a hostage of the fluctuating relations between North and South. For many families, though, time is running out - South Korean officials estimate that up to 4,000 people on the waiting list die each year.